Assume that the hawks get their way — that the United States does whatever it takes militarily to confront and destroy ISIS. Then what? Answering that question requires taking seriously the outcomes of other recent U.S. interventions in the Greater Middle East. In 1991, when the first President Bush ejected Saddam Hussein’s army from Kuwait, Americans rejoiced, believing that they had won a decisive victory. 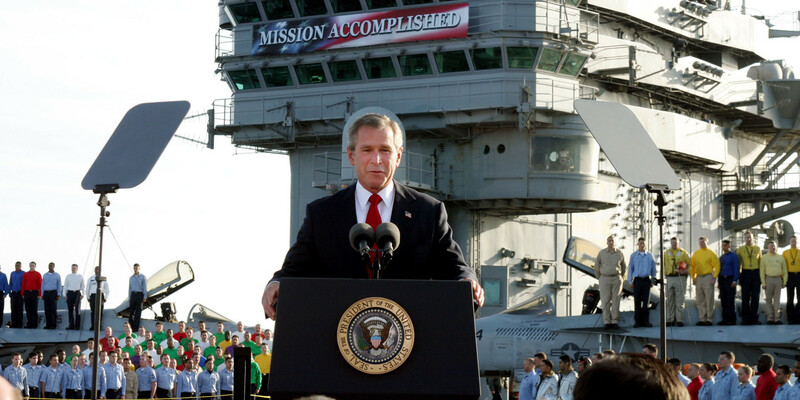 A decade later, the younger Bush seemingly outdid his father by toppling the Taliban in Afghanistan and then making short work of Saddam himself — a liberation twofer achieved in less time than it takes Americans to choose a president. After the passage of another decade, Barack Obama got into the liberation act, overthrowing the Libyan dictator Muammar Gaddafi in what appeared to be a tidy air intervention with a clean outcome. As Secretary of State Hillary Clinton memorably put it, “We came, we saw, he died.” End of story. In the wake of the recent attacks in Paris, the American mood is strongly trending in favor of this sort of escalation. Just about anyone who is anyone — the current occupant of the Oval Office partially excepted — favors intensifying the U.S. military campaign against ISIS. And why not? What could possibly go wrong? As Kristol puts it, "I don’t think there’s much in the way of unanticipated side effects that are going to be bad there." And here we come to the heart of the matter. For at least the past 35 years — that is, since well before 9/11 — the United States has been “at war” in various quarters of the Islamic world. At no point has it demonstrated the will or the ability to finish the job. Washington’s approach has been akin to treating cancer with a little bit of chemo one year and a one-shot course of radiation the next. Such gross malpractice aptly describes U.S. military policy throughout the Greater Middle East across several decades. For starters, the country would have to move to something like a war footing, enabling Washington to raise a lot more troops and spend a lot more money over a very long period of time. Although long since banished from the nation’s political lexicon, the M-word — mobilization — would make a comeback. Prosecuting a generational war, after all, is going to require the commitment of generations. Furthermore, if winning World War IV means crushing the enemy, as Cohen emphasizes, then ensuring that the enemy, once crushed, cannot recover would be hardly less important. And that requirement would prohibit U.S. forces from simply walking away from a particular fight even — or especially — when it might appear won. In the meantime, U.S. forces would have to deal with the various and sundry “kindred movements” that are already cropping up like crabgrass in country after country. Afghanistan — still? again? — would head the list of places requiring U.S. military attention. But other prospective locales would include such hotbeds of Islamist activity as Lebanon, Libya, Palestine, Somalia, and Yemen, along with several West African countries increasingly beset with insurgencies. Unless Egyptian, Pakistani, and Saudi security forces demonstrate the ability (not to mention the will) to suppress the violent radicals in their midst, one or more of those countries could also become the scene of significant U.S. military action. Effective prosecution of World War IV, in other words, would require the Pentagon to plan for each of these contingencies, while mustering the assets needed for implementation. Allies might kick in token assistance — tokenism is all they have to offer — but the United States will necessarily carry most of the load. In hindsight, the Army general who, before the invasion of 2003, publicly suggested that pacifying postwar Iraq would require “several hundred thousand troops” had it right. A similar estimate applies to Afghanistan. In other words, those two occupations together could easily have absorbed 600,000 to 800,000 troops on an ongoing basis. Given the Pentagon’s standard three-to-one rotation policy, which assumes that for every unit in-country, a second is just back, and a third is preparing to deploy, you’re talking about a minimum requirement of between 1.8 and 2.4 million troops to sustain just two medium-sized campaigns — a figure that wouldn’t include some number of additional troops kept in reserve for the unexpected. In other words, waging World War IV would require at least a five-fold increase in the current size of the U.S. Army — and not as an emergency measure but a permanent one. Such numbers may appear large, but as Cohen would be the first to point out, they are actually modest when compared to previous world wars. In 1968, in the middle of World War III, the Army had more than 1.5 million active duty soldiers on its rolls — this at a time when the total American population was less than two-thirds what it is today and when gender discrimination largely excluded women from military service. If it chose to do so, the United States today could easily field an army of two million or more soldiers. To avoid having World War IV produce an endless string of unacceptably large deficits, ratcheting up military spending would undoubtedly require either substantial tax increases or significant cuts in non-military spending, including big-ticket programs like Medicare and social security — precisely those, that is, which members of the middle class hold most dear. While listening carefully to Cohen’s call to arms, Americans should reflect on its implications. Wars change countries and people. Embracing his prescription for World War IV would change the United States in fundamental ways. It would radically expand the scope and reach of the national security state, which, of course, includes agencies beyond the military itself. It would divert vast quantities of wealth to nonproductive purposes. It would make the militarization of the American way of life, a legacy of prior world wars, irreversible. By sowing fear and fostering impossible expectations of perfect security, it would also compromise American freedom in the name of protecting it. The nation that decades from now might celebrate VT Day — victory over terrorism — will have become a different place, materially, politically, culturally, and morally. One of the very few contemporary observers of the effects of militarized foreign policy on domestic policy and social structure still has his thinking cap firmly on. Our civil culture grows more and more militarized as we rely almost exclusively on military-first (and only) solution sets for foreign differences of opinion. As usual, thought-provoking, well-argued, and based on a keen sense of what the US should stand for. Bacevich’s work in this area should be at the center of public discussion, which unfortunately does not exist to any meaningful extent. There is book titled THE FOLLY OF EMPIRE* What George W. Bush Could Learn from Theodore Roosevelt and Woodrow Wilson, by John B. Judis (c.2004). When has this not be true in United States history? This folly? Hubris,arrogance, manifest destiny, war is a racket, addicted to war, perpetual war and more. Not much of this is found in or taught in our schools at most any level and where it is, is there much in the way of debate. Our history has a lot of blood on in its past, on our hands to speak. I look forward to his new booking coming out in April. Just wish it was sooner. What is it about our “American way of life” that we will not, indeed refuse, to examine, to re-examine? Cannot the systems[s] within which we live, less freely than ever before, be re-programmed, re-considered, re-evaluated? Your essay is remarkable for its honesty looking outside; can you deliver the same acumen in an essay that looks inside? Bravo, Col. Bacevich! You hold a mirror to America’s face. Compounding the military insanity you reveal is the strange recrudescence of racism and xenophobia now manifested in hatred of refugees. The analysis of the horrific consequences of further intervention in the Middle East and Central Asia convincingly outlined by Bacevich should give pause to even the most zealous among the warriors on the Christian right. But this opposition among the right might have given Bacevich pause to speculate on what drives the warriors seeking to restore, so they say, the caliphate. The Treaty of Versailles abolished the caliphate putting in its place secular democracies reduced to appeasing the western appetite for oil. So the same sort of rage that inspires the Christian right could well be at the bottom of ISIS and related groups desire for vengeance. It stems from common themes, perhaps, of dispossession woven into a religious fabric. People like Cohen talk about “hard choices”, particularly in Syria, while blandly ignoring the very hard choice that was available right from the start, the choice that is still so unthinkable that it can’t be mentioned: support Assad. His is the army on the ground that can occupy and rule Raqua, where no one else can. But of course that would be unthinkable, because it would dismay and upset the real authors of this war: Turkey, Saudi Arabia, and of course, Israel; and worst of all, it just might work. So get behind Assad; give his army the means to defeat ISIS, and work out a deal to moderate the excesses of his regime later with the kind of incentives the West can easily offer. He would then put a fist on the extremists, and the problem, as far as Syria is concerned, as far as the West is concerned, would be over. But this would not suit the Turks, the Saudis, the Israelis. So it’s unthinkable. This is the true hard choice that our leaders won’t make on our behalf, the one choice that would make us safe: defy our so-called allies and thereby protect us. That’s the hard choice that’ll never get made.